Well, today is the last day of Sale-a-bration! Here is another idea for you using two of the Sale-a-bration stamp sets, Botanical Blooms and Yummy. I’ve used the colours Sage Shadow, Lovely Lilac, Pretty in Pink, Rose Red and Basic Black. And I’ve used the tone-on-tone effect for the base of the Sage Shadow card, stamping Botanical Blooms in Sage Shadow. Then, on the Whisper White, I’ve two-step stamped the flowers … first the outline in Basic Black and then the solid colours in Sage Shadow, Lovely Lilac, Pretty in Pink and Rose Red. And just because it’s been a while … I’ve added Dazzling Diamonds to the flowers! I finished off the card colouring in the sentiment from Yummy using my Lovely Lilac Stampin’ Write marker pen and then stamping that onto the card base. Then a dash of ribbon with some Rose Red grosgrain ribbon and a Lovely Lilac button (threaded with linen thread), finally lifts the card. I could not have made this card without my Stamp-a-ma-jig either!! The colours I’ve used to recreate this card are Pretty in Pink, Berry Bliss DSP and Basic Black. I’ve stamped the flower outline in Basic Black and then coloured it in with my marker pens with the colours Pink Passion, Pixie Pink, Pretty in Pink and Regal Rose on scrap paper. Then I have cut out the three flowers and stuck them over the solid leaf image I’ve stamped in Pretty in Pink. The greeting is stamped in Basic Black and the ribbon is pink taffeta. Although I started to make this card to inspire you with an idea to make a card, I had only half finished this card and I knew I had to send it to my step-mother. So, it will be in the post on the weekend on its way to Canberra. We went to a birthday party for a very old friend’s twins on the weekend (her third and fourth children!). The girls turned two and these were the cards I made for them, something similar but slightly different. Can you tell that I love my Big Bold Birthday stamp set yet? It’s just fab! Anyway, I teamed it up with striped paper from the Winter Bright Simply Scrappin’ kit (which will most likely retire at the end of March) as I just love the colour combo … Real Red, Pretty in Pink, Wild Wasabi, Regal Rose and Bashful Blue. I added a bit of 1″ Rose Red double-stitched ribbon to divide the card, then some crystal effects and Dazzling Diamonds on the cupcake top and balloons. I stamped the “happy birthday” underneath the cupcake. And I used my Pretty in Pink marker to draw the balloon string. It has been a heart wrenching week for many Victorians over the last week, with bush fires that really seem more like fire storms, destroying homes and far more profoundly, taking the lives of too many special people. To help support the people left after such devastation, Stampin’ Up! have offered to make a donation to the Bush Fire Appeal, like so many other businesses across Australia (I even made sure I did my shopping at Coles today and bought my bread from Bakers Delight – all offering donations for our purchases). 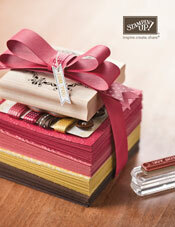 So, from today through to 31 March 2009, when you purchase any of a select group of 10 stamp sets, Stampin’ Up! will donate 50 percent of the sales of these sets to the Australia Red Cross Victorian Bushfires 2009 Appeal. Remember, that if you include one of these stamp sets in a $100 purchase before the end of February, you will also receive a Sale-a-bration stamp set of your choice. Stampin’ Up! will let demonstrators know how much money has been donated sometime after 31 March … so when they tell me, I will share with you how much Stampin’ Up! has contributed to the Victorian Bush Fire Appeal. **In the Summer Mini Catalogue. Today also happens to be my brother-in-law’s birthday, so on a brighter note, this is the card I made for his birthday. He’s a bloke’s bloke … so it had to be as masculine as possible! So, you can see, only one stamp used (and, I know, it’s crooked … that will teach me to use my Stamp-a-ma-jig!)! Otherwise, I used the Outlaw DSP, my star punches and the wide grosgrain ribbon with a bit of linen thread.